Started to like this period in school more and more. Learning alot, I've done some character sketches today for my splashpage I am going to do later (I heard its like a comic book cover, excited!). Combined with the photoshop and illustrator tricks, I think I truly improve due these lessons; On the technical side more than the sketching lessons though. But my sketching is improving also, thats because of the difficult poses we have to give those characters.. Dynamic or still, both are something difficult. And it didn't even has to be realistic! As I said, I started to like sketching people.. Portraits or just a cartoon, poses.. Its all fun to do. 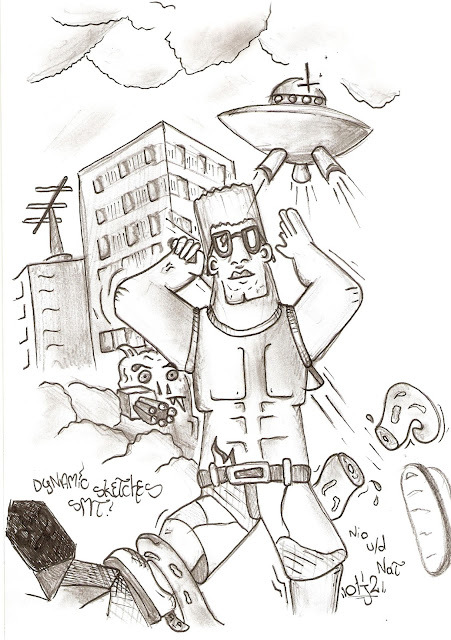 I wanted to give a game icon a new face, I loved DUKE NUKEM 3D back in the days.. Enjoy!